What a ride! Literally. It's been an amazing, educational, thrilling, disappointing, gratifying, incredible, and unbelievable experience. It was all these feelings even as I was upside-down in the gravel trap at Turn 5 wondering how the heck I got there (actually, I knew that part), and how the heck I was going to get out of my broken race car that was upside-down, deep in a pit of gravel, engine still running, and planet earth pressing against my helmet. I had seen this on TV. We all know what happens next. BOOOOOMM!!! Burst into flames!!! Or worse, hot fluid pours into your driver suit! Okay okay, so I didn't burst into flames, nor did any fluids come out of the car. I squirmed out of that car rather quickly for it being dug in pretty good. What did I do next? Well, you'll have to watch the SPEED TV broadcast on Sunday, October 29, at 2:30 PM Eastern. I will tell you this. An angel with the name Maria Altagracia Bonilla, whose name was on my car very close to the roll bar, was there to protect me. Anything can happen in these crashes, and this time, I was not hurt. 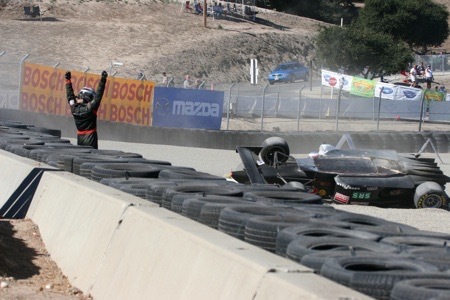 Only the car was hurt, and our finishing position in the 2006 Star Mazda Series points standings. It had been a beautiful day. Qualifying in the morning could not have been under better conditions. No red flags came out during our session, so everyone was pulling their best laps. I too had the best drive of my weekend. My engineer Remi Lanteigne had done another miracle job preparing my car to handle like a dream. It was all we could do without a proper engine budget. I drove as if on automatic pilot. All the basics were instinctual. I took some serious risk, but I had to. When it was done, I had gone 1.3 seconds faster than I had all week. I was sure we were near 4th or 5th place. Remi then tells me "10th, buddy. You did a good job." I was stunned, so shocked, so angry. I had rarely been this angry all year. All that effort, all that risk, all that learning, and all we get is 10th? Actually, it was 11th, as we had tied another driver who was placed ahead of us. Another quarter of a second would have placed us 6th. The field was so tight. Finally, our last race of the year came. We knew there was a good chance for lots of pace car laps under caution, so we had to fight hard to move up. At the start, it was the usual chaos going into Turn 1, with cars swerving and darting left to right, unconcerned if another car was alongside. Dust was flying everywhere, but by some stroke of luck, hardly anyone locked up their tires into the first turn, so we all could see, and not one crash was to be found. The first few laps were so much fun. Dust and gravel was immediately being kicked onto the track by drivers trying way too hard. Much unlike some races at the beginning of the season, I was not at all concerned. Instead, I was enjoying watching all these guys slide all over the place, catch near spins, and spill even more dust on the track. It was as if someone was throwing banana peels onto the track just as you got to a corner, making us all slide and save the car. So much fun. Then, after only three laps, we went into a full-course caution. On that restart, life was good. The car Remi set up was so good on the restarts. I was fast enough to pass, and lost a position trying to make one of those passes. Upsetting, but fun. Then another caution. Dag gummit. Then another restart, and as I set up a pass on that first lap, another caution. Geesh. Then another restart. All I had to do was finish in this position to keep 4th in the points standings. But on that restart, just minding my own business, the car ahead of me dive bombed another car going into Turn 5, making contact, and spinning. I did the best I could to avoid being hit, but there was nothing I could do. When the car landed upside-down, all I could think of was, "GET OUT OF HERE!" I knew drivers have often bonked their heads when releasing the seat belt, so I checked my head's gap to the gravel, and it was touching softly. I unbuckled, supporting myself with my neck (now you know why we work out so much). I tried getting out, but quickly realized I had forgotten to remove the steering wheel. Wiggling back into the car a bit, I removed the wheel, then noticed the engine was still running. Clicked that off, then began to wiggle like a snake, just trying to find a way to get my helmet between the car and the gravel pit I had just dug. Somehow, my huge helmet fit through, and I twisted and contorted my limber body in the most incredible ways to find a way out, all covered in dust. My owner Dan Andersen smiled when he saw me. What a pro he is. What a really great guy. He already knew what had happened when I saw him, no explanation was necessary. He said, "Sometimes you just can't avoid these things Gerardo." I lost him a lot of prize money because we fell to 6th place overall. I don't blame him for wanting to wring my neck, but we both understood, in that moment, what can happen in this sport. My mind immediately turned to 2007. We're working on our driver lineup for next year. After numerous conversations with many of my mentors over the last few weeks, it is my intention to race a second season in Star Mazda. Anything can happen between now and then, so nothing is truly certain just yet. I must bring him new sponsorship business. But, there is a lot to gain from the continuity of a great team like Andersen Racing, and I hope to be a part of it for a long time. Many thanks to Dan Andersen and his entire team for making me feel like a rock star all year long, for giving me a 100% reliable car at every single race, and for believing in me as a professional race car driver. 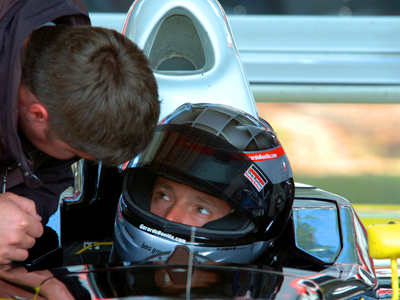 His staff, including my engineer Remi Lanteigne, my lead mechanic Jim Desautel, DAG Mike Reggio, Michelle Kish, Jake, Don, Glenn, Rossela, Roger, Steve, Greg, Mike Andersen, and the rest of the crew, are an amazing group of people, the kind of people I had dreamed of working for all my life. 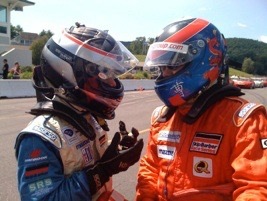 Many thanks to Skip Barber Racing Schools and Series. 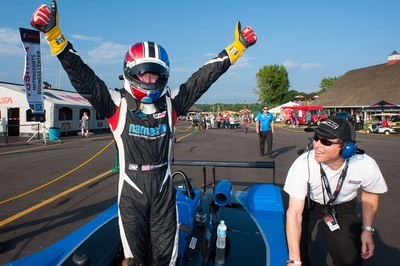 Terry Earwood of Skip Barber let me into the company eight years ago, beginning a learning process that would define my career, and enable me to grow into a professional. Many thanks to him, and to the rest of the people at Skip Barber for all the years of education and friendship that led to this great season. 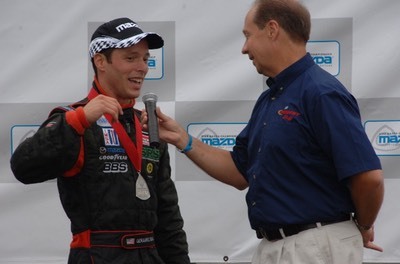 Endless thanks for the 2005 Skip Barber National scholarship that helped put me in a race car in 2006. Many thanks to my sponsors, including Surgical Reimbursement Specialists, Carmela Sausages, King Canada tools and equipment, Virtual GT racing simulators, CDOC racing equipment, Automatic LLC for aviation service, and to my past sponsors including Sam Dorio and his Northside Medical Group, who provided me with my racing start in earnest many years ago. Many thanks to Ken Burris of the BMS Group, for taking me on as a professional client in his motorsports marketing and sponsorship company. You have been a great help this year. Thanks so much. Many thanks to my investor / philanthropist / personal sponsors. It's nearly impossible for a kid like me, without family money, to pursue a career like this without you guys taking out your checkbooks and writing checks you may or may not see a financial return for. It is your friendship that gives me the motivation to remain responsible to the opportunity that I have. Many thanks to Racing for Kids, the charity of race car drivers who spend time at hospitals around the nation to improve the day of many young patients. I have learned that these children are some of the hardest fighters in the world and know of no adversity too great. I thank Racing for Kids for allowing me to volunteer my time under their umbrella. They say race car drivers don't cure cancer, but now, by visiting, I can help these kids fight cancer and win. Can you understand how important that responsibility is for people in my position? Many thanks to you, for reading my stories this year. I hope you have enjoyed every one of them. Please visit us at a race track next year. 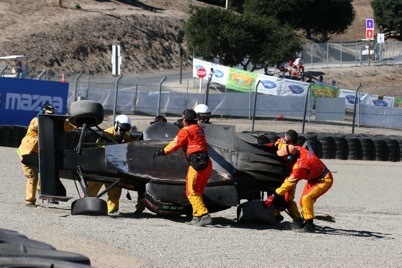 Odds are, I will be an Andersen Racing driver for a long time to come. 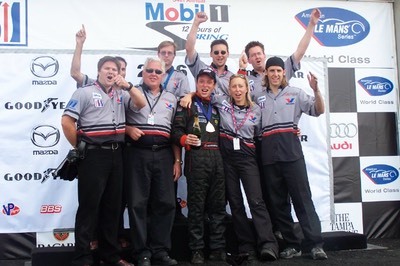 Final 2006 Season results, including Laguna Seca race results and overall Season Points standings available online at www.starmazda.com. Friday at Laguna Seca brought out some of the best weather of the year. You'll have to forgive me now, because I'm going to be very hard on myself. Despite the fantastic weather, I drove poorly. Not only did I drive less than my best, I made a critical mistake with my data that I won't go into, and don't want to drag on. The point is that its now time for a serious attitude adjustment. The last time this happened was when racing legend Divina Galica told me rather sternly, "Bobo, you drive way too much like an instructor. You really need to hit a few people." She wasn't kidding, and I accepted her mentoring and put it into place and won a National Championship. I didn't have to crash to win, but I had to believe anything was possible. Today, the same adjustment is in order. I've left too many inches of asphalt behind, too many passing opportunities behind, to many chances to get back to power sooner. Just to be squeaky clean. That's not going to cut it anymore. Tomorrow is a new day, and a new opportunity. My engineer Remi Lanteigne is planning to carry a spare radio battery for when he wears out the first one in qualifying. I just can't leave the track tomorrow without knowing that I truly gave it everything I have. It all comes out tomorrow, and then some. I will find a new limit, a new level in Gerardo. 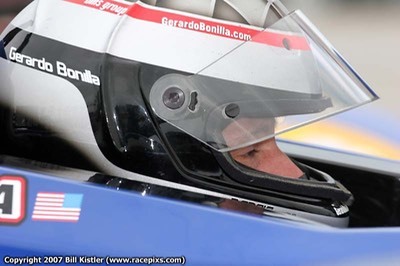 And so we've reached the final chapter of the 2006 racing season for Gerardo Bonilla. Happily, the 2007 book is already open; more news on that soon. But now, let me take you to Monterey, California, home of the Mazda Raceway at Laguna Seca. The American LeMans Series is also here holding their season finale. There are many cars, drivers, hopes and dreams coming together here under sunny skies and perfect temperatures in the 60's and 70's. Yesterday I made my third hospital visit on behalf of the Racing For Kids charity organization. This time we traveled up the highway to Palo Alto, California to the Lucile Packard Children's Hospital, part of the Stanford University medical complex. I met a hospital staffer who's last name is "Bobo". What are the odds? The nurse who served as my tour guide from hospital room to hospital room has a "real job" of teaching guitar, plays in a band, then spends her free days volunteering at this children's hospital. Amazing. This time around I had my first experience with cancer patients. These kids were between ages 2 and 18. I saw about ten of them. Each of their rooms were completely isolated. I had to pass through an airlock door system. Inside the airlock, I was asked to wash my hands. Yes, I had to wash them at each door, all ten times. I could sense the power of what this place was. Every child I visited had to overcome one of life's most unfair and most daunting adversities; cancer. My problems were nothing, but the least I could do was make them smile, even for only a moment. The 18-year old actually had karting experience and was thrilled by our visit. Many of the children had their parents there, who were almost as happy to see us as the children. Imagine spending your life 24/7 in a 12 foot by 8 foot room doing chemotherapy. Yes, there certainly was great power on this floor of the Lucile Packard Children's hospital, and it was generated by these amazing kids, pushing along, fighting, not giving up. I don't know why I had waited so long to give time to Racing For Kids. Count me in next year. This is what's important. 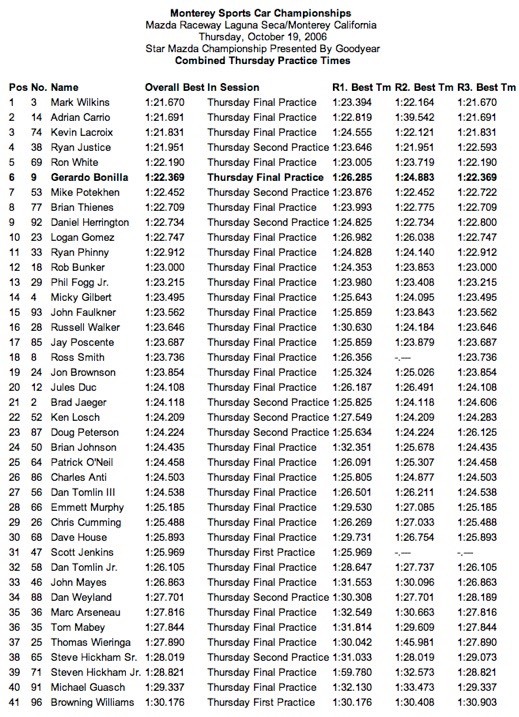 Today, we began our three practice sessions at Laguna Seca. This track is well known worldwide, and more famous in American road racing circles for Alex Zanardi's pass on Laguna ace Bryan Herta in a Champ Car race some years ago at the famous "Corkscrew" turn. Zanardi could not have done the same move here today, as the Corkscrew was home to huge splashes of gravel, dust, and dirt sprayed across the track by our fellow drivers searching a bit to hard for speed. 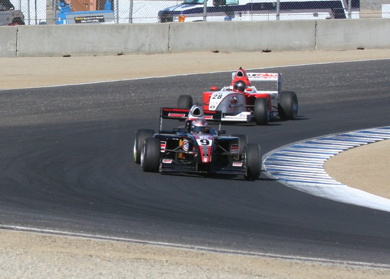 For the first practice session I just wanted to learn the track in the Formula Mazda. Sure, I had done it in a Skip Barber car, but the first time in the Mazda is always a learning event. I didn't do so well on the timesheets, finding traffic every lap until the last two laps. Finally alone, all I could learn in that time was enough for around 21st place. Geesh. 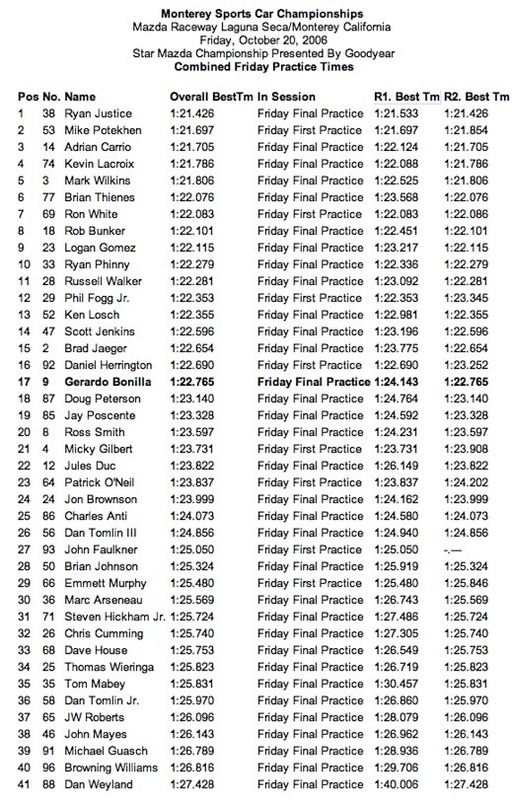 In the second practice, I had to serve a 5-minute penalty for passing under yellow in Session 1 (oops). As Murphy's Law would be in effect, a minute after I entered the track after serving my penalty someone spun and stopped the session. At the restart I had enough time for three laps. Yup. 20th place. Now we're getting somewhere. Finally, after much nudging by my engineer Remi Lanteigne and a secret weapon provided by my mentor John Pew, I was able to get with the program in the 3rd session. I had a great out lap, passing several cars (that was fun! ), and getting aligned with other fast guys. By the end of that session, we were 5th overall (and 6th for the day's combined times), and about 0.7 seconds off the top time. We're back, and that lap had a bunch of errors I'll try not to make tomorrow. Two practice sessions for Friday, then Qualifying and our final race on Saturday. Stay tuned! Thank you all for all your support, cheers, well wishes, favors, bailing me out of financial holes, and most of all, for your friendship. I'm just glad I can share this experience with you.